Santa Ana de Velasco (founded in 1755 by Friar Julián Nogler) was one of the last Jesuit Mission towns to be built, just twelve years before the Jesuits were expelled from this area of Latin America. In fact, its church and religious compound were not actually built when the Jesuits were there. The priests had begun work on the materials needed to build the church, but were unable to begin construction before they were expelled. The indigenous community took it upon themselves to complete it. Because of this, it is smaller than the churches in other mission towns. One of the most interesting things to see here is the organ found in this church. It dates back to the Jesuit era, and is nearly 300 years old. It was restored in the year 2000. Other antique instruments were also found here, one of which is a large harp similar to those found in San Rafael and San Miguel as well. 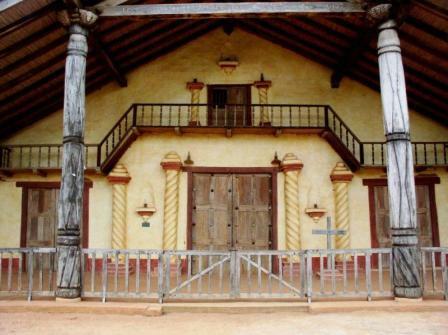 Usually people visit this town as part of a day tour starting in San Ignacio de Velasco. It's only about one hour from San Ignacio. The tour covers San Miguel and San Rafael as well, and ends up back in San Ignacio at night.